Last week, communities across the country held teach-ins, public meetings and rallies to demand justice in schools, as part of a national campaign to “Stop School Pushout.” To resist the “zero-tolerance” brand of school discipline, civil-rights groups demand rehabilitative programs aimed at ending the so-called school-to-prison pipeline, the pattern of harsh disciplinary practices that lead to the suspension, expulsion, and criminalization of kids of color. The movement to stop overpolicing and punitive policies in schools is intersecting with a painfully tender side of educational policy, as urban schools seek to desegregate and promote diversity in early childhood education. We now know both segregation and discrimination begin on the very first day of preschool. An analysis of 2014–15 data from New York City’s new universal pre-K (UPK) program by the Century Foundation (TCF) suggests that, while the city has succeeded in enrolling 69,000 preschoolers in a comprehensive early education program, instead of opening opportunities for building equity, pre-kindergarten classrooms are among the city’s most racially divided, potentially extending the scope and depth of educational segregation. Universal preschool is hailed as a key to education equity. 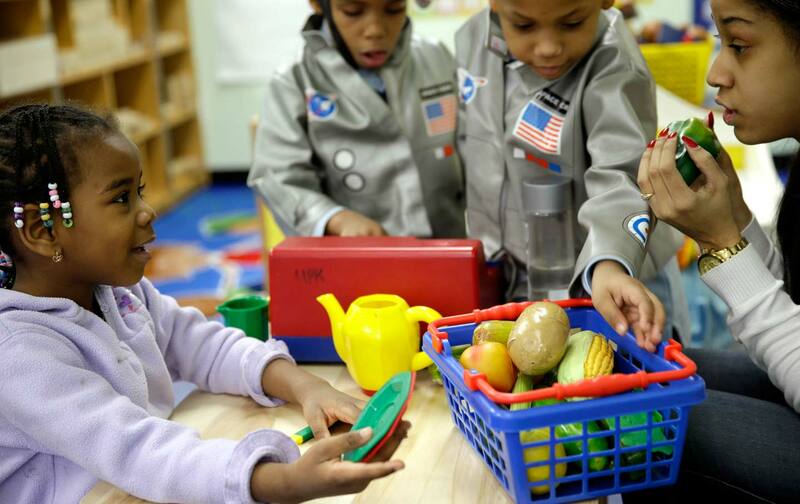 Segregation systematically holds back socioeconomic advancement for children of color, and preschool enrichment is vital for helping remedy the disadvantages of poverty and discrimination in early childhood. To redeem the promise of Brown v. Board of Education, preschool classes should be an ideal place to start correcting inequality, right? But the data indicate that endemic school segregation in K12 is replicated, perhaps worse, in preschool. Universal pre-K has dramatically increased access, meeting full citywide demand for classroom placements, covering some 60 percent of eligible 4- and 4-year-olds—a meaningful milestone for families crushed by soaring childcare costs and educational deficits. But TCF shows that many of these new preschool classrooms are even more segregated than their kindergarten counterparts, in part because the system is largely discretionary and open-ended, in less regulated community-based settings. In one-sixth of all pre-K classrooms, more than 90 percent of students come from the same racial or ethnic group, whereas only one-eighth of all kindergarten classrooms has that same level of racial homogeneity. Across both grades, just one in five classrooms is highly racially diverse, with no racial or ethnic group comprising more than 50 percent of enrollment. The system, not surprisingly, mirrors segregation in the communities where classrooms are housed. To unravel the problem of segregation, the preschool system needs to be understood in terms of the city’s rigid housing-segregation patterns, as well as its socioeconomic divisions. In the first year of the universal pre-K program, about 40 percent of students attended pre-K at regular schools or at a handful of charters, both of which are linked to standard K-12 schools. Other classrooms are housed in community-based non-school sites or community-service centers, which are less regulated. The racial divisions are deepened by divided funding, as over a fifth of pre-K students are in subsidized classrooms that cater to children linked to the city’s child-welfare system, many of them facing deeply distressed financial situations. TCF also found that pre-K segregation mirrors linguistic divisions. “Two-thirds of pre-K classrooms have more than 70 percent of students with the same home language, and one-third of classrooms have more than 90 percent of students with the same home language.” In some enclaves, kids from Yiddish-, Chinese-, and Russian-speaking families appear to be fed into pre-K classes in local ethnically based community centers. Housing pre-K classrooms within the city’s rich network of community-based organizations is in many ways a positive thing. But if the goal is diversity, and making pre-K a springboard toward a more just, integrated, and diverse educational system, young kids still need more of a demographic mix in their classrooms. But as tensions rise over school discipline trends, we see a more fundamental reason to be wary of segregated preschools. Black preschoolers are suspended at disproportionately high rates. New research on subconscious bias suggests that even preschool teachers racially profile, treating black children with more suspicion; sadly, black boys are “precriminalized” before even learning their ABCs. Preschool diversity alone cannot overturn structural inequality in schools. Yet educational diversity is critical, not just as a way of redistributing resources but as an imperative for a diversifying, globalizing society. This is socially challenging but necessary work for correcting the damage of segregation and bring real restoration to impacted communities. Deeper investments are needed in building a culturally aware, diverse teaching workforce, including raising working conditions and community engagement in preschool programs. The persistence of racism across a youth’s life cycle means the early years are pivotal: There’s a cruel through-line between the unfair disciplining of a black preschooler, and the police profiling of a black teen on a street corner. It’s a lot easier to stop the cycle in preschool, before it becomes a full-blown crisis, than to wait until it reaches into our streets and prisons.